Tramper on the Routeburn Track Great Walk high above Lake MacKenzie. Mountain Daisies (Celmisia verbascifolia) in abundance. 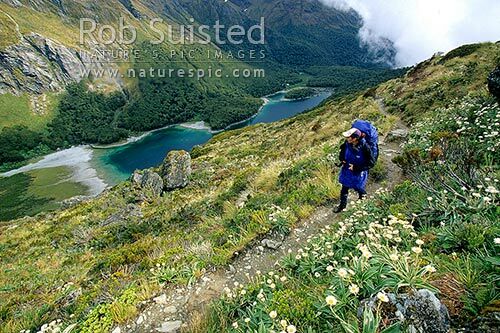 Hiking the Routeburn Track, Fiordland National Park, Southland District, Southland Region, New Zealand (NZ), stock photo.